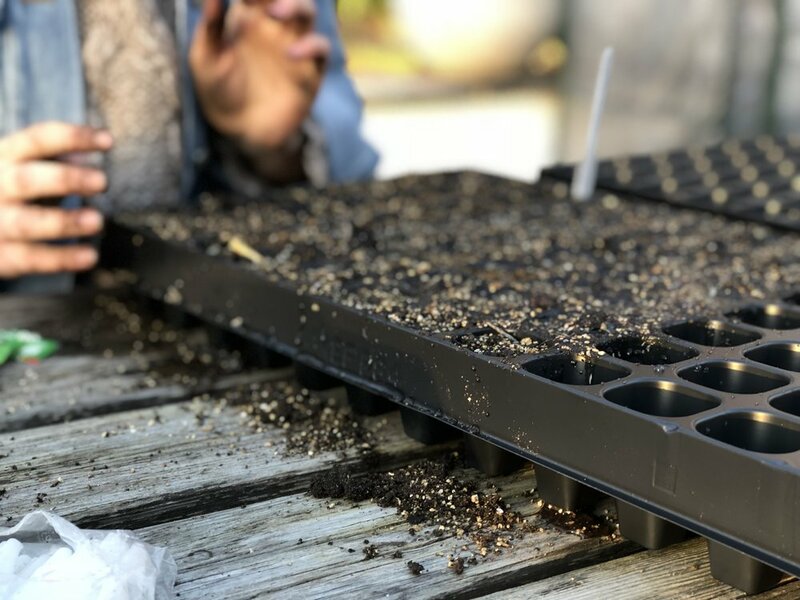 Back in November, I started to make a long list of all the seeds I would like to grow in 2019. I took into account all my failures from the previous growing season, as well as what I enjoy eating, and came up with my own 'must grow' priority list. I couldn't wait to start sowing again. A few months later I moved to Surrey and needed to rethink where I was going to be able to have my veggie garden. I'm currently living at my boyfriends family home. I have very kindly been given a generous plot at the front of the house and promised I would grow as many tomatoes as possible (challenge accepted!). Since the move, I have been without a greenhouse or any other outdoor space to house my seedlings until the chances of frost pass. So, for now, they are scattered all around the house, on every windowsill and clear surface I can get my hands on! It also means I have to follow the sun as it moves throughout the day which is not ideal, but hey, you gotta do what you gotta do. The most tender seedlings growing are the tomatoes and chilli peppers. I will keep them inside for at least another 6-8 weeks before hardening them off. I also have aubergine and cucumber plug plants due to be delivered by DT. Brown Seeds later this month. I figured I shouldn't over-sow delicate seedlings this year because they might not survive with my current setup. For leafy greens, I have multi-sown Swiss Chard, Spinach, Kale, Lettuce & Caribbean spinach and they are currently keeping cosy in the utility area that gets lots of indirect sunlight all day. Despite all my beans and peas being taken over by black fly last summer, I will not be defeated. All my broad beans, mangetout and french dwarf beans are growing in root trainers and have started to raise their heads through the soil. I'm a little disheartened by the growth of my sweet peas as even after pinching them out; they still look leggy and sad. I will continue to give them lots of TLC and firmly cross my fingers. For root veg, I have already sown leeks, beetroot, celery and garlic. Still to be put in the ground are onions (red & white), carrots, parsnips and salad potatoes. Note to self: put those damn potatoes in the ground already!! I am really excited by the idea of having a handful of annual cut flowers growing alongside the vegetables this year. Not just because they look pretty, but because I want to start making homemade potions and lotions from plants with healing properties. With that in mind, I have sown a few varieties of Calendula, Marigolds, Nasturtiums and Clary sage. For more ornamental purposes, I have also sown Daucus (wild carrot), cut flower Dahlia and a very well loved classic, sunflowers. Looking after these tiny pockets of life has kept me on my toes, especially as I had to re-sow on a few occasions when I woke up to find some mice had enjoyed a lovely midnight snack... But like all happenings in life, it is all a part of the process. Have you begun your sowing adventures yet? Is this your first year growing your own produce? Let's share stories. If you’d like to hear about all of this in more detail, I made a video walking you through everything I’m growing at the moment.